Noiseless tracing of the graph on a large LCD graphic screen. Automatic determination of the beat number for all conventional watches. Rate measurements on mechanical watches, LCD-watches, quartz- and tuning fork watches. Display of the rate, beat error and amplitude. Scope tracing of the beat noise for error analysis by means of the beat pictures. Printout of a measurement report in a numeric, tabular or graphic form. 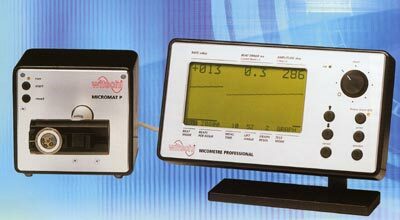 Ideal combination with the automatic microphone MICROMAT P.
All results are displayed in a tabular form at the end of the measuring cycle. RS232 interface for the connection of printer.